25 May 2017 Unlocked content from the archive. Ben Pobjie’s latest book Aussie, Aussie, Aussie continues in the same satirical vein as Error Australis: Australian history made palatable with a dose of snark and good humour. 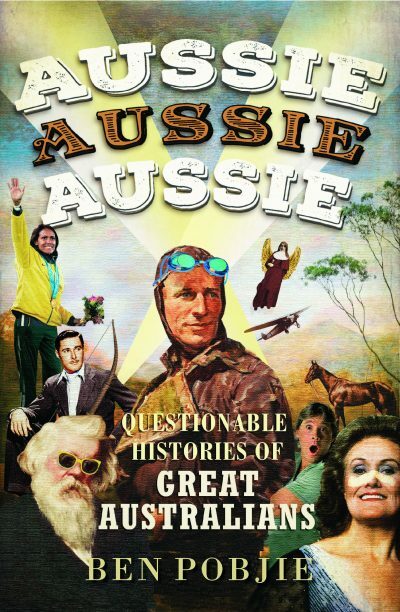 The subtitle is ‘Questionable histories of great Australians’ and Pobjie romps through an eclectic selection of some of the more noteworthy locals, who, as he points out, ‘did things that would be impossible for most of us, inept and slothful as we are’. He begins with Bennelong, one of the first Aboriginal people to join white society, who taught his colonial captors a thing or two about Indigenous culture. Other potted biographies include the usual suspects—pioneers like John Batman, entertainers like Joan Sutherland and sporting greats like Cathy Freeman—but there are some surprises too (Phar Lap!). If you like your Australian history earnestly written, seriously laid out and extensively footnoted, Aussie Aussie Aussie is not for you. But if you can handle subject titles like ‘Julia Gillard—the Ginger Pimpernel’, and ‘Errol Flynn the heterosexual blade’, you’ll appreciate this book. Please note though, Pobjie’s lighthearted tone does gloss over some pretty dark historical events.